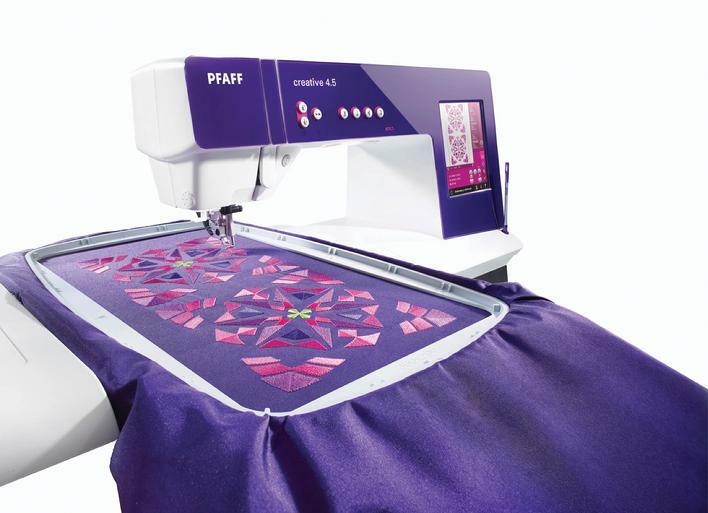 • Large embroidery area – Choose between two different embroidery units for your PFAFF® creative performance™ sewing and embroidery machine. The larger unit features an embroidery area up to 360 x 350mm so you can embroider your unique, personal creations in one hooping. • 270 fantastic embroidery designs – Created by fashion designers for the PFAFF® creative performance™ sewing and embroidery machine. The built-in embroidery designs are grouped into three different categories (machine designs, mini designs and quilting designs) making it easy to find exactly what you want. large amounts of fabric or batting. Phenomenal! The potential of the sewing machine is demonstrated by the perfection of your creations. No matter which fabric you sew, refined details guarantee that the results look as professional as the best ready-to-wear. The Original IDT™ System – Integrated Dual Feed only from PFAFF® for over 40years! Absolutely even fabric feed from both the top and the bottom. Stitches Impressive – a huge selection of more than 480 utility and decorative stitches. Including a wide variety of 9 mm decorative stitches, Stacking Stitches and Maxi Stitches up to 48 mm wide – for perfect results and enchanting embellishments. Choose one of the 4 built-in sewing fonts to personalize your project. Achieve professional results with a selection of fully automatic buttonholes. stitch. Change the angle of taper for unlimited opportunities. 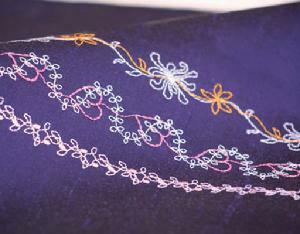 Combine decorative stitches or design elements instantly to create truly unique borders and designs. 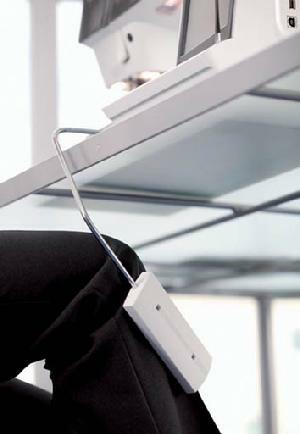 • Electronic knee-lift – Raises the presser foot with an easy movement, allowing you to keep your hands on your project. • Automatic presser foot lift – Raises the presser foot instantly when the needle is set to stop down and/or at the end of a seam after a thread snip. 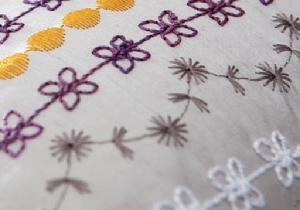 • Free-motion modes – Three modes for free-motionquilting, thread painting or darning. Select the bestmode for your specific technique. in the fabric for pivoting, appliqué and more. needle stitch on the screen. 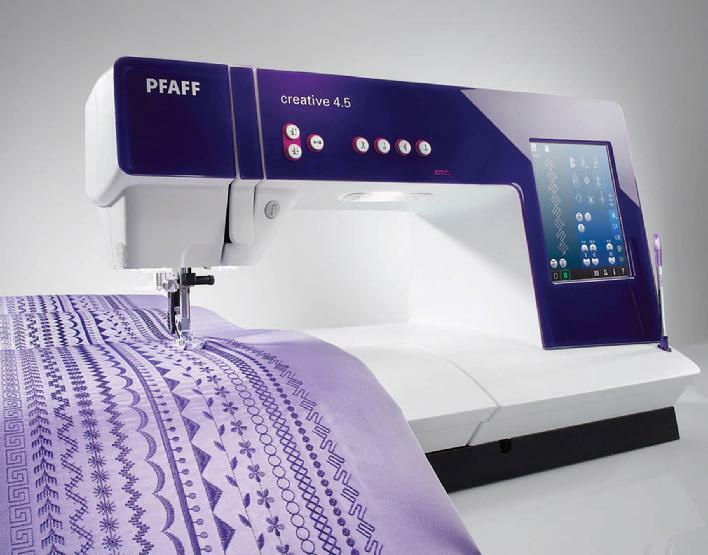 • Option to use it as an embroidery machine –Purchase the creative performance™ sewing machine by itself or add an embroidery unit and expand your potential. PFAFF® has an impressive range of presser feet and accessories to enhance your sewing experience. Select from accessory feet to help you be more precise or others developed for specialty techniques; there are even accessories especially for quilters. View our collection of embroidery hoops, optional embroidery software and more in the new PFAFF® online accessory catalog. Touch the quick help icon for instant informationor use index help for more built-in advice. 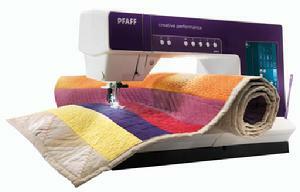 PFAFF® creative performance™ sewing and embroidery machine remembers your preferred setting. equences or designs in a folder to sew them again whenever you wish. Search for design files easily. Direct USB Connection, or USB Stick. ccessories close at hand with removable compartments for presser feet and bobbins. • Stylus holder built-in! – Keeps your stylus at your fingertips. • Updateable – Via the Internet. • Use an optional external mouse – To navigate our screen. Save yourname to the PFAFF® creative performance™ sewing and embroidery machine, select your language and your preferred start stitch, change sound settings, save favorite stitches and settings, etc.